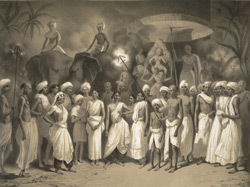 Lithograph of a Hindu religious procession at Madras by L.H. de Rudder (1807-1881) published in 1848 after an original drawing by Prince Aleksandr Mikhailovich Saltuikov dating from July 1841. In Prince Saltuikov's description of his journey, he states that he stayed at the Governor's house while in Madras. Madras was founded by the English East India Company in 1639.